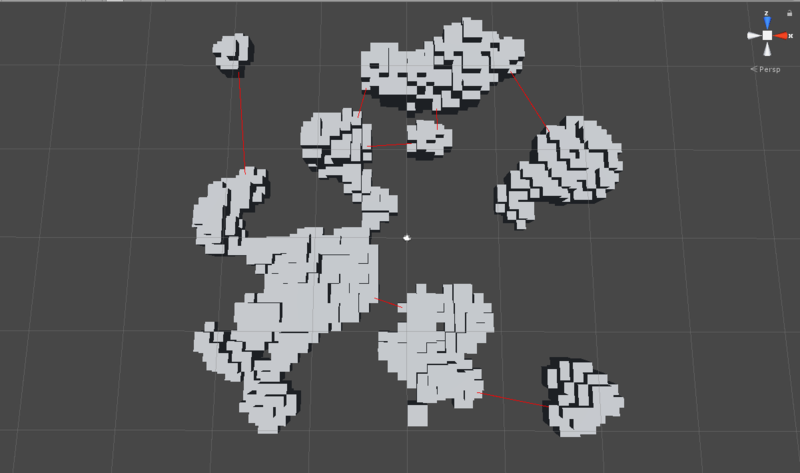 First of all a little premise: I'm following this tutorial on YouTube for procedural 2d cave generation in unity using cellular automata and I'm extending it in order to make caves in all three dimensions. With this approach, caves are based on a 3d matrix where if a cell value is 1 it is a wall and if 0 it is an empty space. The "rooms" created, after being logically connected, need to be "physically" connected by making a path of zeros in the 3d matrix and the tutorial explains how to do this in 2d. Can you, please, suggest me the approach on how to draw a discrete line (of zeros in this case), in a 3d matrix, that goes from point A to point B? I'll attach a screen of a map example where rooms are drawn with cubes and red lines are the logical connections. Browse other questions tagged unity c# 3d procedural-generation unityscript or ask your own question. How to generate caves that resemble those of Minecraft? How to play a video on a TV model inside a game? Animation inside a .obj file? How to detect line break in a String using UnityScript?